Earlier this week I got to see an exhibition at a local gallery. It was a real treat. The venue, the Fralin Museum of Art (the former Bayly Museum) at the University of Virginia is small but quite well laid out and is well worth a visit anytime you are nearby. The exhibit highlights early works by Georgia O’Keefe … especially those that were done while she was living in Charlottesville VA and was a student and later an assistant instructor in UVa’s summer program. Anyone who has studied O’Keefe’s early paintings and drawings knows that she was influenced by many of the contemporaneous art movements including Fin de Siècle design, Post-Impressionism, the Symbolist movement, the ideas of Wassily Kandinsky, and most especially the ideas and later the instruction of Arthur Wesley Dow. You can see all those elements in her work in this exhibition. The curators of the show have included lots of historical ephemera, books and class registration materials from O’Keefe’s summers at UVa, as well as sketches and photographs. This exhibition concentrates on Georgia O’Keefe’s work as she was transitioning from her more memetic early training at the Chicago Art Institute and the New York Art Students’s League to her much more personal way of working that utilized strategies of abstraction. 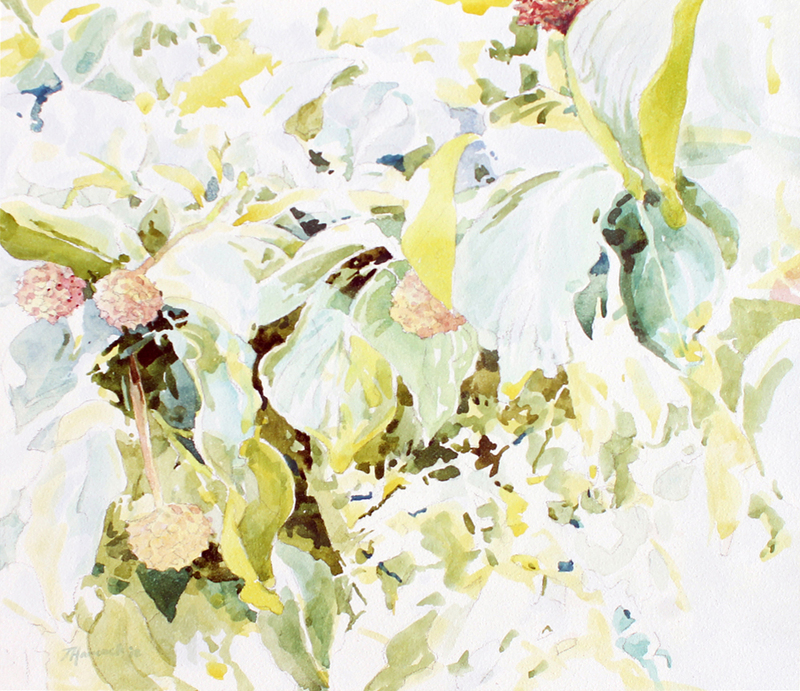 The two works above are early watercolors of the building on the grounds of UVa that show Dow’s influence with an emphasis on design and the hybridizing of traditional Western and East Asian art. The old studio art (and sometimes art history) professor part of me really loved getting to piece together what I already knew about her work and life with all the added details located here. 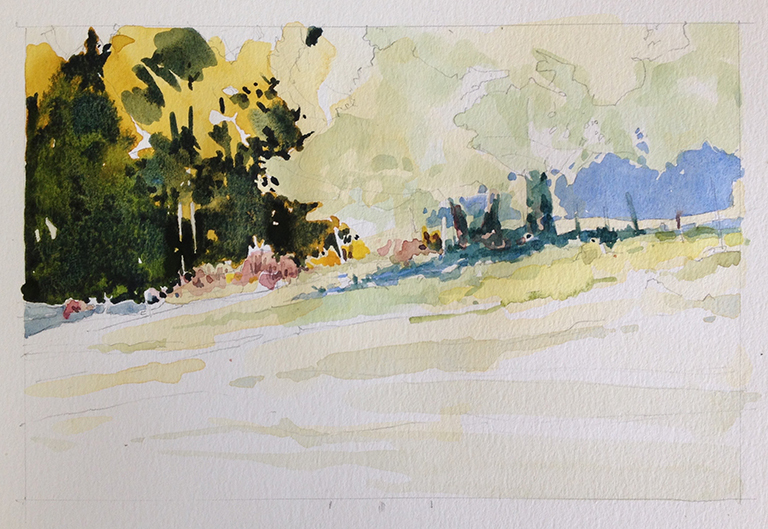 And the inveterate sketcher in me was tickled to see the onsite watercolors from the university campus (if you are a UVa alum, sorry for not calling it “grounds”) too. But my favorite part … what got me really excited … was seeing here the process of O’Keefe becoming a more expressive abstractionist. That is best seen in the small watercolors inspired by the hills and mountains of the Ragged Mountains and Blue Ridge of the Appalachians. She experienced them directly; exploring, hiking, and camping in those peaks and valleys which are visible to the southwest and west of Charlottesville. These watercolors are are small and simple. And, to me, profoundly compelling in their fresh, simple directness. 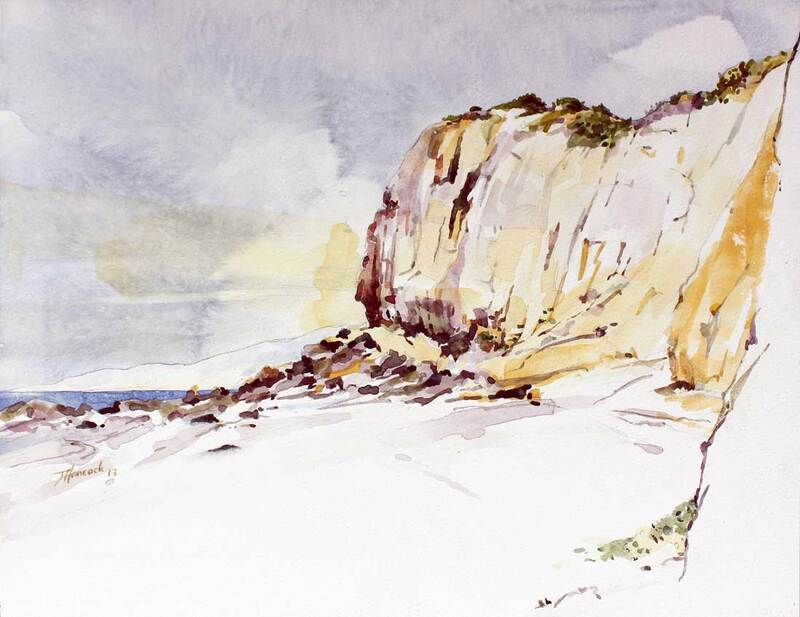 There is certainly more than a few hint of the much more well known, even famous, early watercolors she created soon after while she was teaching in western Texas. The charcoal drawings and watercolor of this period launched her career as a seminal figure in early 20th century American modernist art. And they are fun to look at too! If you can get to the exhibit before it closes, I recommend the visit. If not, I am sorry; but you could contact the Georgia O’Keefe Museum in Santa Fe. That museum organized a similar exhibition that ran from 2014-2016. They might just have made a catalog for that show. Thanks for reading here today. If you have any questions or thoughts, please do comment below or get in touch via email. You can also connect via my website. Below these next lines, you may see ads. I do not have any influence in WordPress posts nor do I endorse any institutions, services, or products shown. Oh well, WordPress has to pay their bills too. One Really Big Fire; A Lifetime Passion! Sometimes I forget how much I enjoy looking at the watercolors and watercolor sketches of Joseph Mallord William Turner. And what I love about his work is the process and progress of his painting over the span of his decades as an artist; the nearly radical simplification and experimentation that he undertook that seems to have been a passion. I’m especially drawn to his sketches using watercolor and other media on paper; it is those that I want to share with you here. At the beginning of his career, Turner made meticulous drawings, usually with graphite, and laid in multiple layers of transparent or translucent color to create images portraying not only light and dark values but evocations of depth, mass, and texture. As you can see to the right, his early color choices were typical of the English School of the time. Turner used a cool transparent blue and an earthy orange that would produce a natural grey tone when overlaid on each other. Only at the end would he add just a few touches of more vibrant color. Below, in this next apparently unfinished piece that he painted in Oxford, you can see just how these opposing tones create a grey. It was a tone Turner used as the basis for much of the image’s structure. This is not far off the method used by earlier artists … from Jan van Eyck to Holbein … a grisaille underpainting with layers of ever stronger clear color glazing and a touch or two of possible semi-opaque or opaque color at the very end. As Turner matured, we can see that he became surer and surer of using more direct modulation of color. He still often began the sketches with graphite line work, but even those marks, as well as much of the subsequent brushwork, became less and less purely definitive of physical detail; ever freer and more expressive of visual and emotional experience. Above we have again have an unfinished piece. Notice how both lines and color marks, while very much related to the things, the physical phenomenons, that they record, these marks a not as physically precise. Instead they are more spare and simple, leaving more room for the artist and eventually the viewer to complete the intent of the image. We can see in this late (1823) sketch of a coastline with a lighthouse, the now bolder, even rougher use of brushwork. And as his career continued he even achieves an a nearly incorporeal quality, images were composed only of the shaped wavelengths of light we call color. 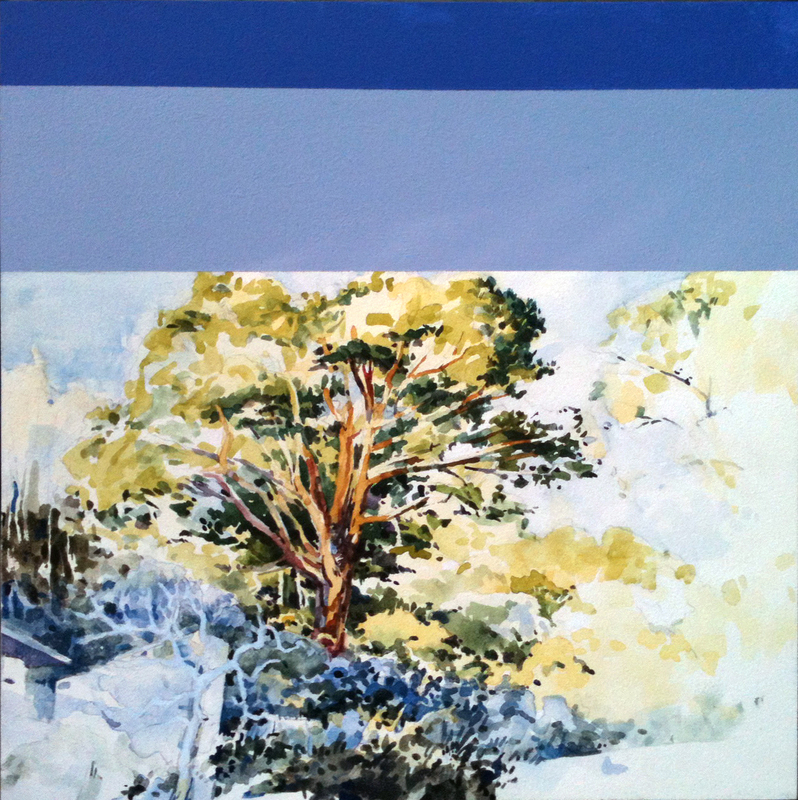 worked on easel paintings as well as aqueous media on paper. The problem was that, while the it was well written and talked about the specific paintings of these five near heroes of mine, it only showed the works of four of them. The author wrote about Turner’s watercolor sketches of the burning Houses of Parliament, but omitted any example of those pieces. Ouch! So, I guess this is my visual form of a rant of sorts; sharing the images they might have included in the e-article (the first and last images in this blog) … and a few more to boot. Here’s hoping you enjoy them. Tofan Gheorghe is an artist living in Dublin, Ireland. 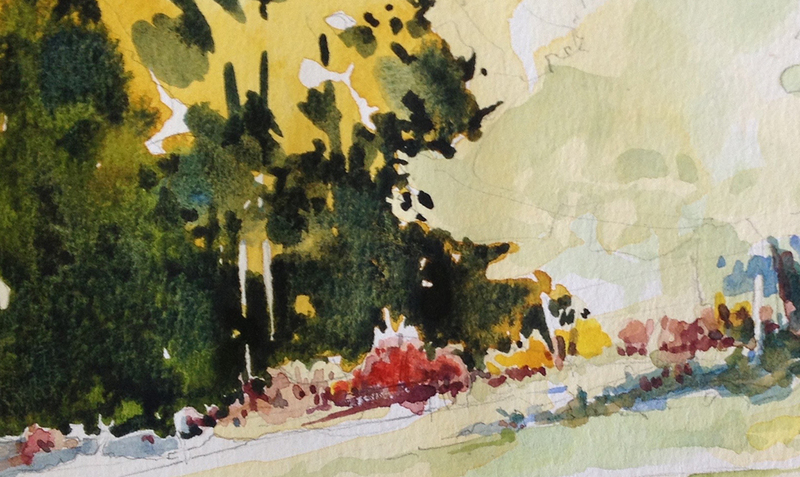 Perusing his blog site reveals some very nice loose watercolors/watercolours! Having just posted a very different watercolor and ink sketch showing part of a local monument here in the States … it was nice to see another artist’s very different take on a similar subject. 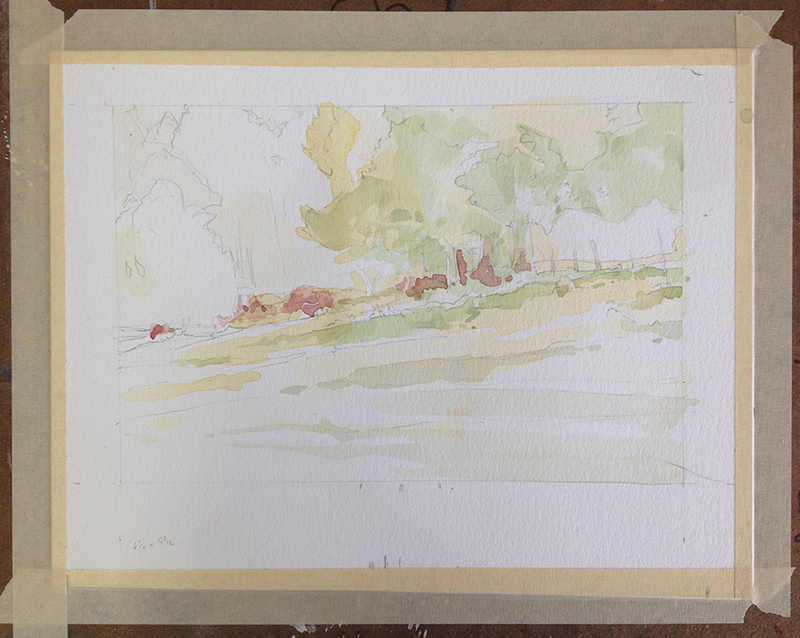 Working up a Watercolor Sketch … or is it a small Watercolor? 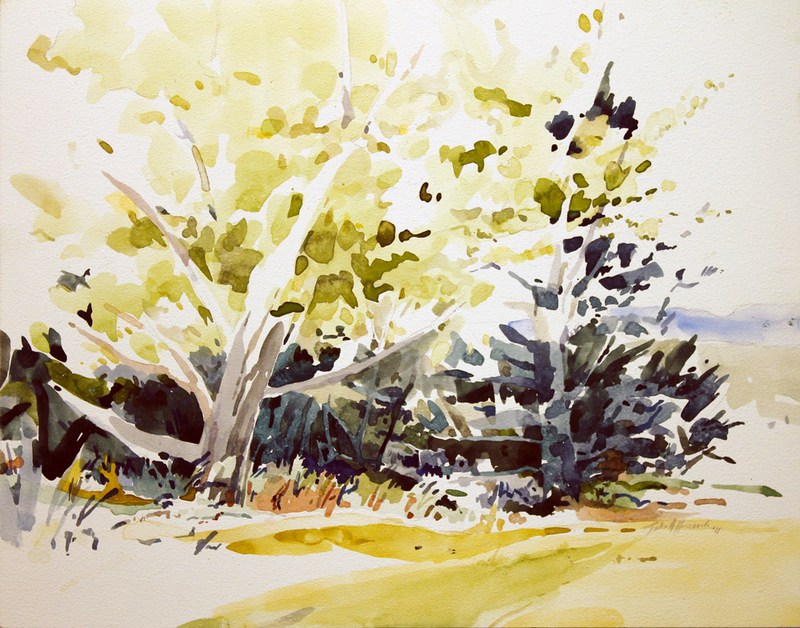 Last Wednesday and Thursday, I was supposed to be teaching a plein-air watercolor workshop at a regional art center. That plan didn’t quite gel; I took the now unscheduled time to work unfettered as a gift from the universe and I painted outside in the wondrous fall air! I even had some extended time to paint some in the studio. It was a nearly perfect compensation! 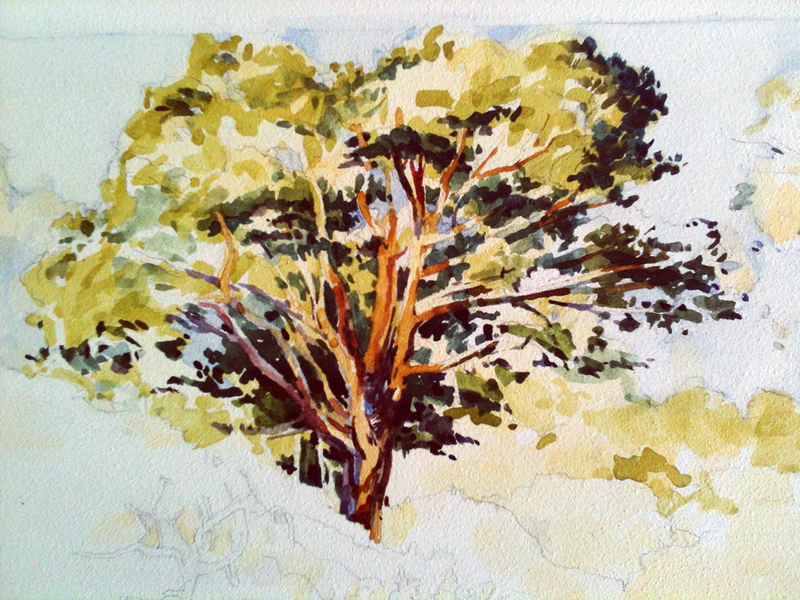 While working on one smallish piece, I assumed that I was creating a watercolor sketch. Soon, I began to question if that was what I was doing. 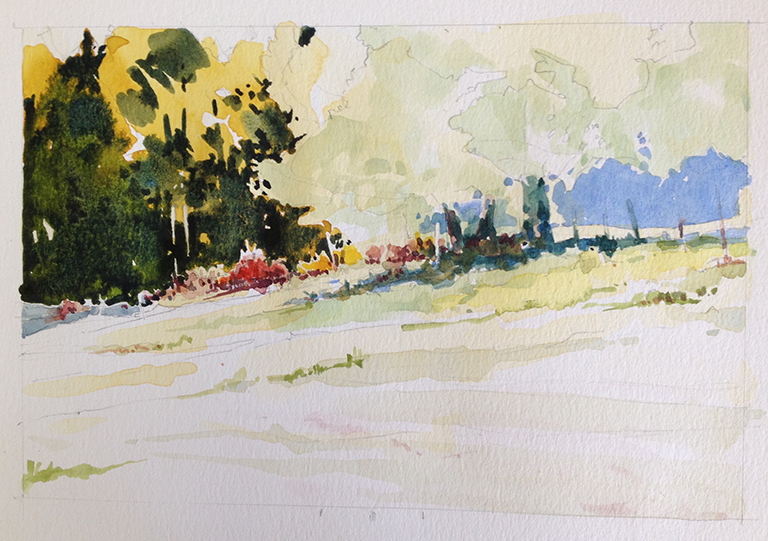 You see, I am not always sure when a watercolor sketch really becomes a small painting. I have been drawing, working with sketches, making paintings, and sometimes a lot of other types of art as well, for many years now. But I am still not sure where, or even if, there is a line somewhere between those watercolor sketches and watercolor paintings. ??? Let me back up and set the stage. Earlier in the week I had been helping some adult students with techniques and processes used to work with watercolor on wet paper … what many call wet-on-wet or wet-into-wet watercolor. If you have looked at my work, you know that in my pure watercolors, I mostly utilize what is known as the wet on dry techniques. But as I do every so often, I responded to all the wonderfully rich and soft colors that Autumn has served up this year by making room for some wet surface painting. 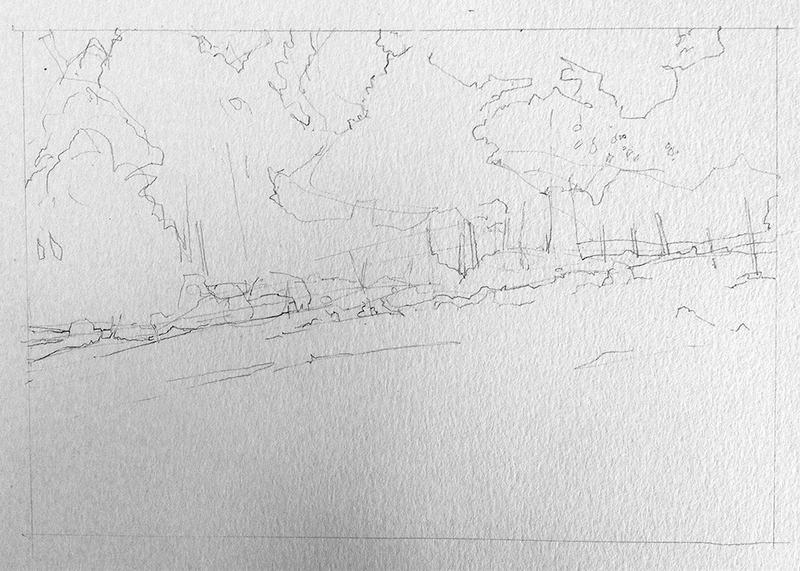 Beginning as I usually do, with a brief pencil line drawing … I was soon adding some delicate layers of color … mainly to the slanting ground of the hillside, the bushes along the “ridge-line” of the hill, and the foliage and trunks of the most forward cluster of trees. These forward trees’ trunks, branches, and leaves cover almost two-thirds of the top tier of the watercolor. As this completed my initial mapping of the image, I quickly moved on to adding some rich golden yellow color into background on the upper left side. Before the thick golden yellow dried, I moved in with two very dark green, one a bit blue and more neutral … the other a bit darker but a “purer” green. 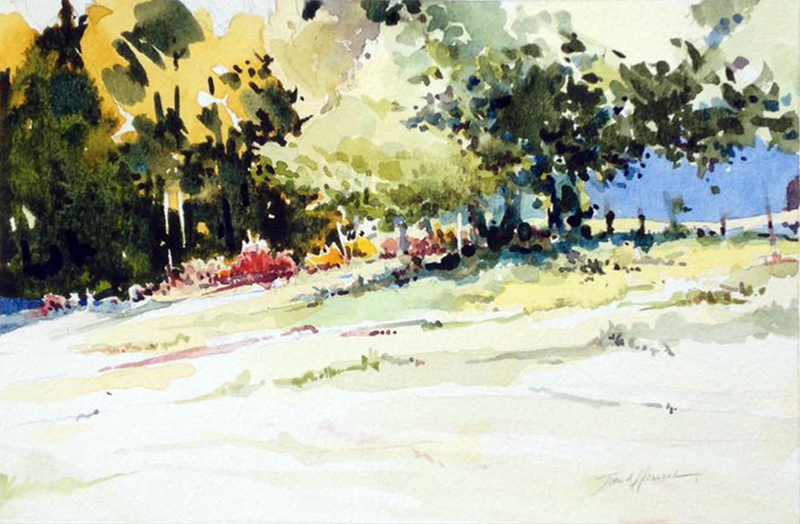 As I watched this new rich green-yellow mix began to set up and dry, I turned my attention back to looking at and working all around the image, finally concentrating on the far right side of the image … especially the deep background visible under the canopy of main “central” trees as an area of shadowed blue and violet-blue. At this point I wasn’t yet sure if: #1) I wanted to make the dark bright trees at the center as bold as the ones to the left … or #2) if I wanted to paint a deep blue violet into the now bright wet blue on the right side of the composition. NOT making a nearly instantaneous rational or intuitive decision was my first hint that I might now be painting rather than sketching. Instead of tackling that decision … choosing one of those two major options … I once again began to “play” some more all over the image, making small tweaks to the composition. 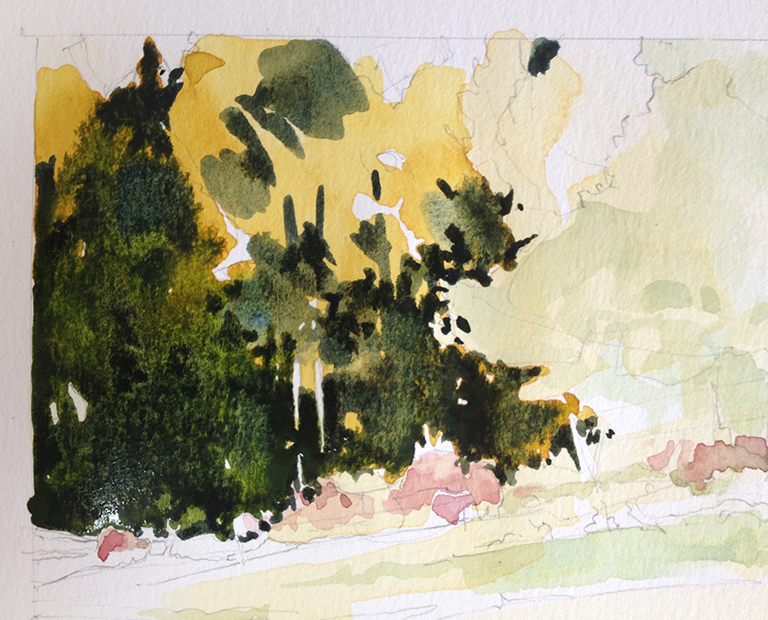 I also spent some time working on the small bushes that appear out from under the central trees, descending along the hillside in front of/below the still extremely wet dark yellow-green mass that I had painted just a few moments before. I scrubbed out most of the dull rose hue I had started with in the main clump of bushes. Next, I made a darker mauve-burgundy blend that I pushed into the other reddish plants along the edge of the swelling line of the hill. Finally, I scraped and scuffed the paper of the main bush before applying a purer, warmer red … as well as a few touches of the burgundy. Well, as so often happens … life and many other tasks intervened in the process of finishing this piece. Dinner finally called. The next day, my students, doing necessary work out in the yard, a few household tasks, visiting with family … even another painting or two begged for my attention! A couple of days passed before I returned to work on this little image. Luckily for me, I had made a photo or two of the location … as well as having a clear memory of my slightly agonized struggle to clearly see and process the image on location. I carved out an hour or so to reconnect with all that and spent a bit of time looking at what had started as a simple sketch. It was time to finally commit and finish it! About 20 minutes of painting spread out across an hour and a half or so of evaluating … as well as drying time between new color layers and it was done! 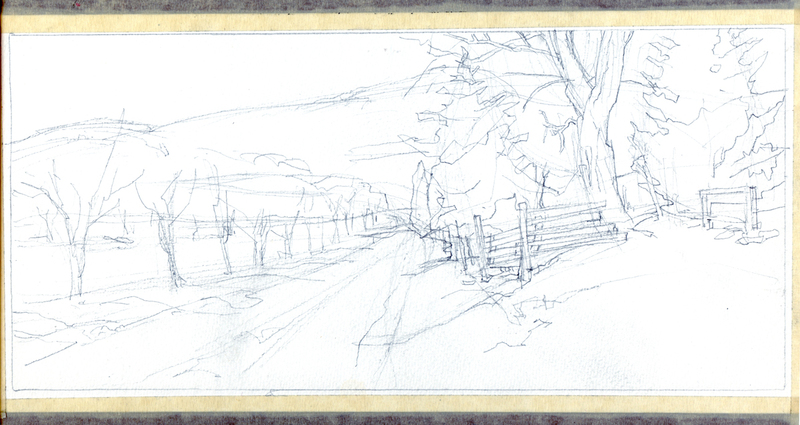 … 2) I would rather know which one YOU think it is, a sketch or a small watercolor? Below this line there may be adds of some kind. I don’t pick them or sanction them or their product or services they advocate. But WordPress has to make a living too … so we all smile and cope as we will. I love mixing and matching … aligning and contrasting. I do it with media. I do it with imagery and content. I’ll even use that way of working with design and stylistic approaches. Mash-up isn’t quite the right word; it is the right concept though. Maybe I am overly invested in both classicism and the early modern. This week, as I prepare the last pieces for a two-person exhibit at a college in North Carolina, I have had several pieces that have been a hard to bring to fruition. One of them seems to have hit upon a happy ending … the other two, I am still struggling with. 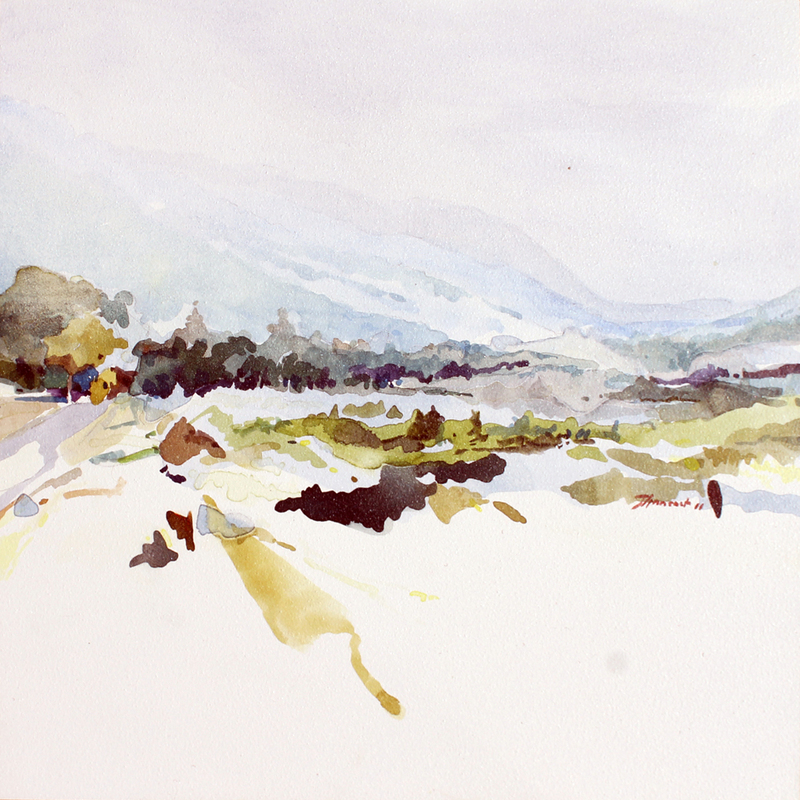 The first, an image that started as a sketch out in S. California, became a small series of watercolor studies. Soon, using the rough sketch, studies, and a dozen or more reference photos … I began the painting on an aqueous media panel. None of my photos captured the almost golden light I sensed that afternoon as I prepared to enter the Getty Villa. But working from my sketch and color notes … I played about until I got an image that did portray the felt color of that afternoon. A few days ago, as the painted section with the trees neared completion, I added a few passages of gouache, hoping to increase the solidity of the bare tree branches located in the blue violet shadow on the lower left. 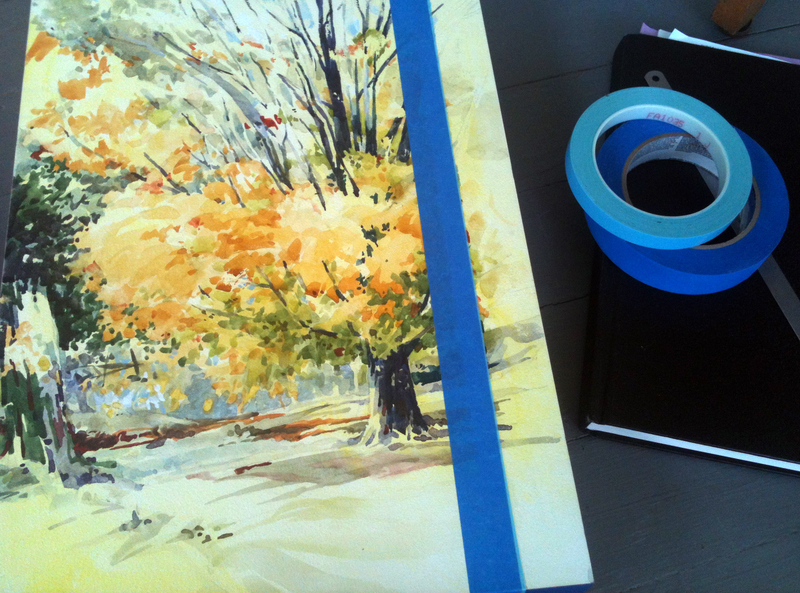 the panel, taped for laying in color across the top register. The representational content is 90% to 95% complete … ? Yesterday I decided to stop working on the trees; not permanently … but to begin deciding what to do with the upper third of the image. I flirted with at least six or seven possibilities. Maybe a very thin red horizontal band and a muted blue grey above it? Two blue bands with several small vertical shapes in rich yellow and dark muted green clustered in the upper right corner? or perhaps in the upper left? In the end, I decided to keep this one more simple. Two tonally related but different blue bands, the darker and more intense one across the top. Here it is with the color bands completed. I still think that a combination of small staggered vertical bands, interrupting the major horizontals. might be interesting. But, for now, I’ll leave it as it is, tidy-up up the “loose-ends” and move on. I do like it. Maybe I can be happy with this one as it is. As I said above, the other two are proving to be much harder to bring to a satisfactory conclusion. Like the painting above, I have reference sketches and photos from last fall, as well as compositional studies for this painting. The finished maple tree in autumn was to have a strip (possibly broken into a few vertical blocks) on the right side … and maybe a “free floating” block of color somewhere inside the composition in the lower left. I was pretty sure of what I wanted it to look like; now I have almost no clear vision of how it should end up! 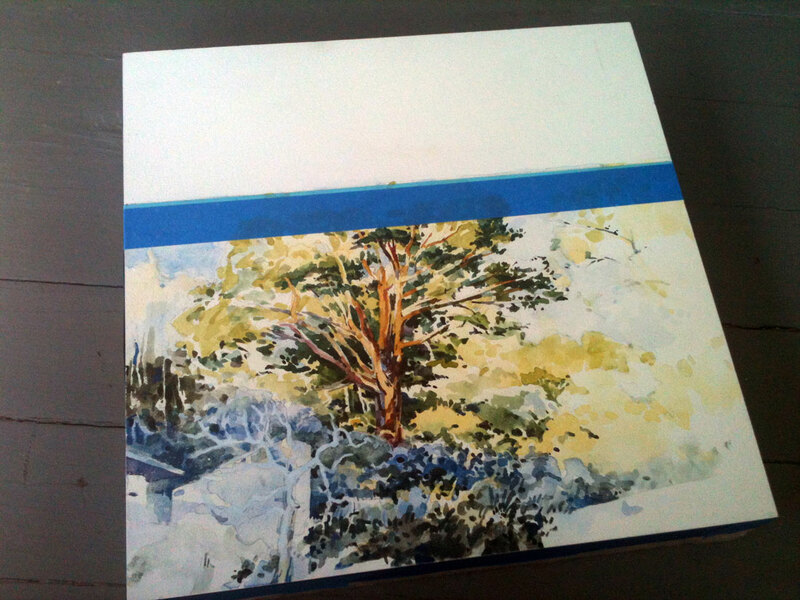 The next one, a smaller horizontal piece, was started in the summer of 2012 … and I never really quite loved it. Here it is to the right. What I liked was the general rhythm of the stalks across the field. But despite the passible late summer humidity-laden coloration, it doesn’t feel like the design is dynamic enough. Below is the new revision so far. Originally the red-violet band was wider … the width of what is now both the dark olive green and the red-violet color panels. The newly white area is going to get a drawing of the same heather (maybe two drawings?) at earlier stage(s) in the plant’s growth/maturation process. I have left the white a bit translucent so that a “ghost” of the original color and drawing do show through. Maybe I am being indecisive. I do know that I am being pretty picky (or is it just being fickle?). As I said Mash-up isn’t quite the right word for my combination of classicism and the early modern. I am not sure what is the right description … but I will post progress on these two a bit later. Exhibition of Sketches open, Reception today! Sometimes little things are really quite important. Certainly the smallest thing can be extremely satisfying. 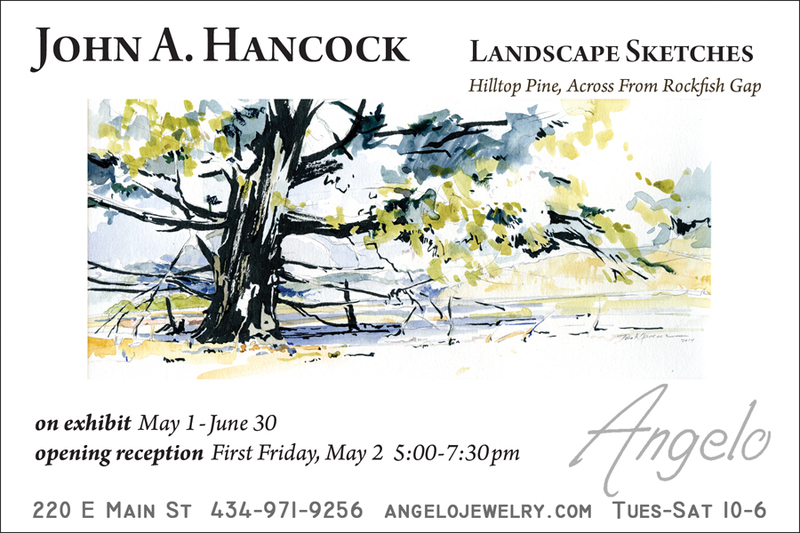 I have a new show opening today in Charlottesville, Virginia at Angelo (on the downtown pedestrian mall). It is a wonderful small venue. The show itself is also small, just 14 pieces. All the work is quite small too! After my big shows of really BIG drawings earlier this winter, it is really a nice treat to put up these smaller, more intimately scaled pieces. And these works are interesting and exciting to me precisely because they are more personal, intimate, and quick in terms of the art making. 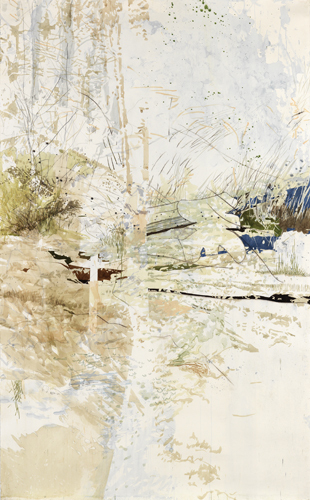 All of them are landscape sketches, most started and finished in one session … with the simplest of materials. There are a few that are almost panoramic in vision despite their very small scale. A few are really close-ups of landscape details. Most of them though are fairly typical landscape images … at least they are typical to my eye. The best ones are done very quickly and quite simply. A few have a hint of Demuth or Marin (not so much Homer or Girtin this time) … and just maybe the quickness (if not the sublime quality) of a Turner watercolor. The less successful ones may help me create better larger works but, of course, I don’t share those. They are now “working” sketches. You would have to come to my studio or one of my classes to see those. The ones at Angelo for the next two months are, I think … pretty good. If you are near Charlottesville sometime between May 1st and June 30th, please take a look and tell me if you agree. Some things below this line may be advertisements; we know that even WordPress has to make a living. My apologies if it is something distracting or if it isn’t to your or my taste/liking. It has been a busy Spring. Winter hung in there and made it a longer chilly start to the spring season than usual. That means the garden and plants need some extra care, some extra work this year. I have not gotten all the gardening tools properly prepped for the season yet either. Instead, I have made lots of changes to my classes at the college. (I do so hate to get stale in the drawing class studio!) At the other end of the professional duties, my exhibition schedule and speaking engagements have kept me hopping. The traveling was fun, even as we dodged the worst of the snow and ice storms! Now, at the core of my artist life, the making of artwork, things have again settled into a pattern. Yes, a slightly a-rhythmic pattern … but one I am trying to keep moving along. 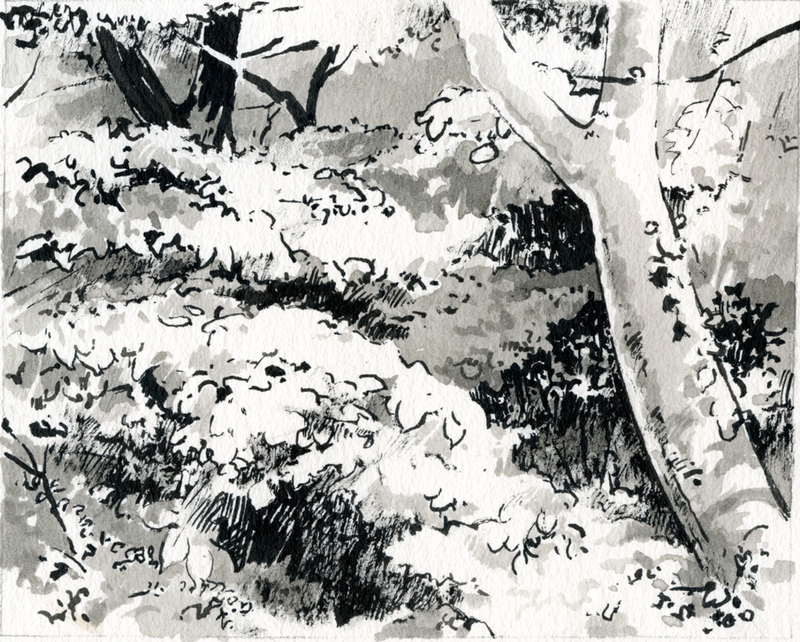 Not in the studio very much; I have been working outside whenever I could … wielding pencil, ink-brush pen, and watercolor. So much so that my students have remarked that they have seen me along the roads close to campus and further afield. They think it is quite funny (¿amusing or weird?) when they spot me sitting on the cold ground in 40 F/5 C degree weather; standing at my sketching easel in 30 mph/50 kph winds. But it is part of what I do to prep for new work; my version of hunting and gathering … seeking out new images, interesting visual material. I have other ways of generating visual “primary sources”, but working alla-prima, en-plein-air … is so mentally refreshing. Sometimes the work comes out totally fresh and clean. Almost sparse/spartan in its finished state. Other times they are labored, even overworked. Unclear. Those are not as exciting, but they still teach me something, challenge me to think, re-think their source and what it is I find engaging and exciting about it. Whichever one it is, clear, clean, and well executed … or overthought and overly fussy … I am happy to be seeing, reacting, and thinking about images outside. Just pass me my hat and my sunscreen! This past March, while it was still snowing and freezing here in the mountains of the Mid-Atlantic, we visited our son out in S. California. When we arrived it was in the 80’s … but dropped back into the lower 70s and even the 60s. It was a welcome interlude, and on one of the warmer days we explored the area around Point Dume. We trekked over the rocks and, after getting to a less visited side of the outcrop, we settled down for a respite on the beach. Everyone else soaked up some sun, sat around relaxing and chatting … or played a bit at the edge of the water. Me, I needed some quite time. So I walked over to and climbed up into the next set of rocks and relaxed. Looking back across the sandy beach, the rocky point, and up the coastline, I was quite happy that I had brought a small set of sketching materials and my camera. Quietly drawing and laying in a few quick patches of color was a really enjoyable way to spend my time. I could have spent several hour making a few more sketches … but it was almost time for lunch. So, after shooting a few dozen photos of the surroundings, I packed up my gear and went in search of seafood and some more delicious family time too. When we returned home I decided that I wanted to do a three to four foot multi-panel piece based on this experience. I even promised my son that he could have the piece if I felt really good about it when it is completed. Well, this week I made the one of the first steps in that process, a larger study using the sketch and the photographs I created three months ago as resources. So far I feel pretty good about it … though it looks a bit more like a “tinted drawing” than the “painting” that I had envisioned. It may also be a bit to timid in comparison to the sketch. The first sketch had at least a few subtle hints of Demuth’s delicate control and something of Marin’s energetic brushwork. But that is why we do studies, to work out the kinks in our ideas ahead of time … to get back to some of the fearless joy of our first encounter. Here is the study I finished this Saturday. I will keep posting the progress over the next few weeks. I am happily exhausted. And the studio is a raging mess. I delivered a solo show Monday and yesterday … a show with 44 pieces. Lately I have posted images of the quick sketches … wash and brush drawings and quite a few of the watercolor and pencil pieces too. As is usual for me of late, there is also a little bit of a twist. 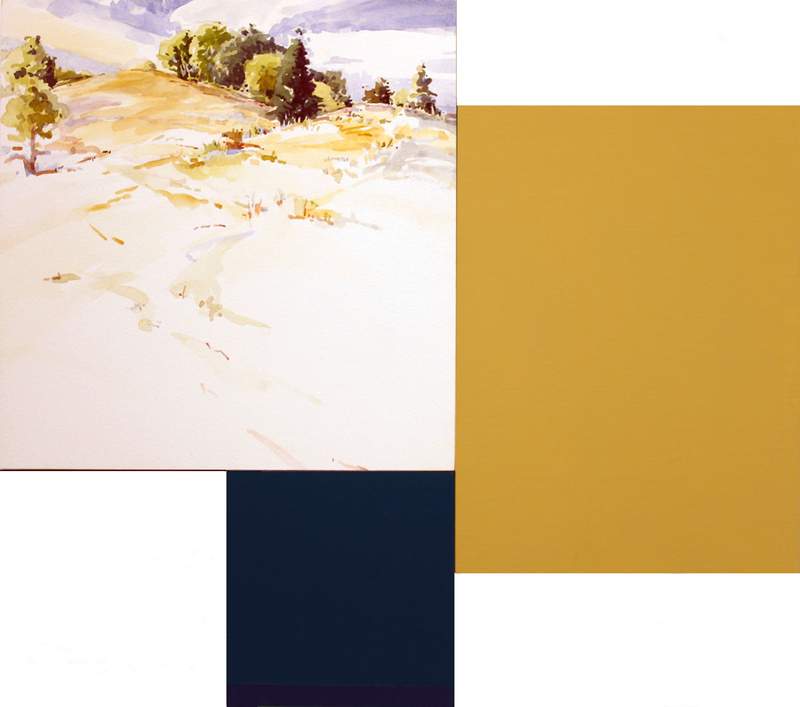 In some of the paintings I have employed the strategy of including blocks of color; color passage that both obscure parts of the subject matter in the painting … and which actually set up some type of color harmony within the composition. 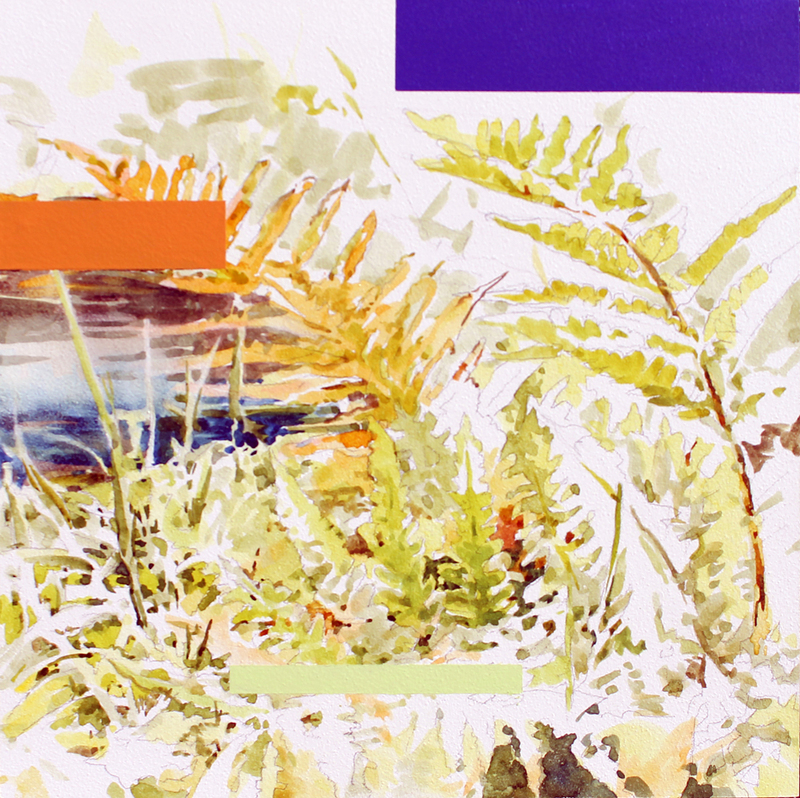 Those pieces are single panel images (like the Creekside Fern one at the start of this blog) and also multi-panel works. These paintings are actually mixed aqueous media; making use of watercolor, gouache, acrylic and even a latex based paint. The show is open today and I have just seen the installation. Quite pleased is an understatement; I think it is really well done. The front gallery, where all the paintings on panel are displayed, is a large, open, and airy space. Most of the smaller watercolor studies and sketches are displayed is an intimate little gallery, a space flooded with soft light. In this smaller space about 20 works are arranged and clustered rather pleasingly. And in the transition space between the two galleries there hangs two very large watercolors on paper and a grouping several of my small works too. 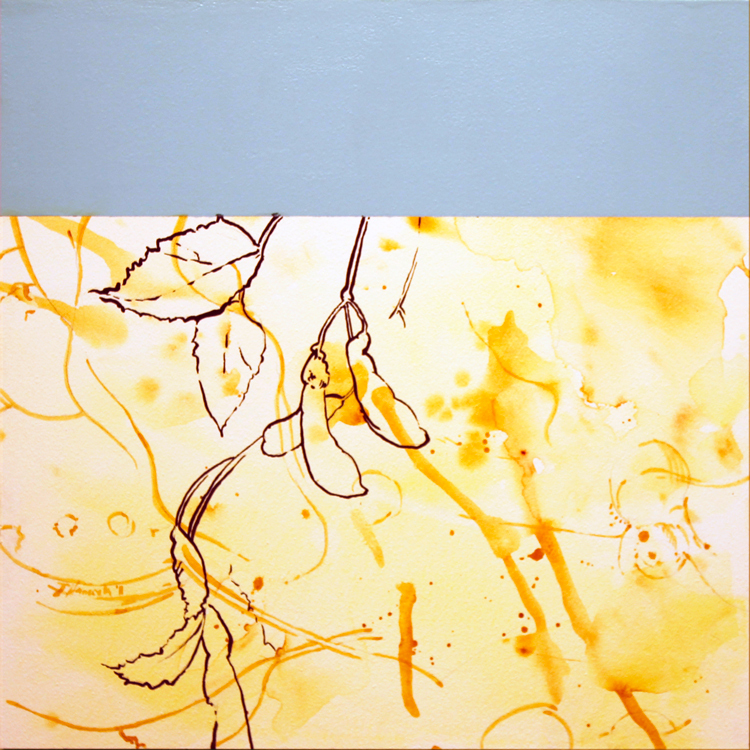 The exhibition runs through November 9th at the Staunton Augusta Art Center. For those of you who are local, the opening reception is Friday, September 14th, from 5-7. 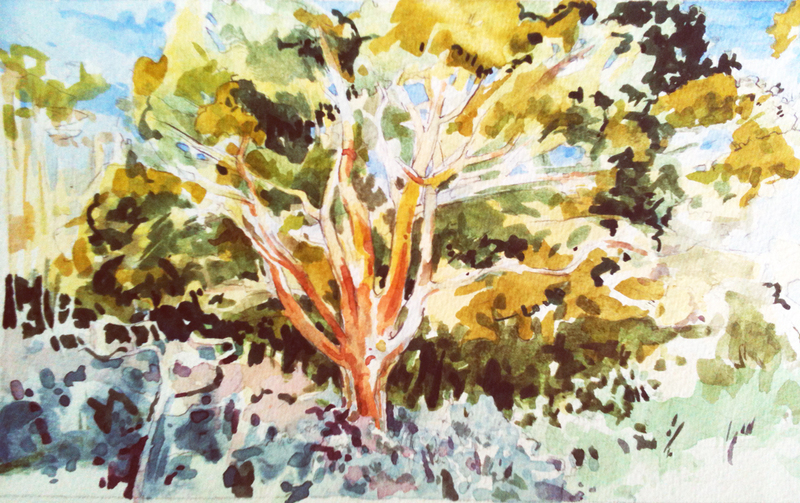 While I often draw and paint monochromatically outside, I also like to do small color studies. Many have a full range of color. Others, like the first and last one below, have just a few hints of hue … not enough to carry the full weight of the original scene … but just enough to give me a hint when I take it back to the studio. Or maybe enough to send me back to the location later to work up a painting on site! For my color sketches, the work is done with pencil and watercolor. In some sketches, I rely mostly on the watercolor, in others the pencil work is more important. Usually though, I let them play pretty much equal roles. That isn’t the “accepted” way to work with watercolor. But it is the way I like to work. This, of course, this is just a preview of a few pieces that will be in my upcoming exhibit in Staunton, Virginia. Let me know if you liked one of these. It is great to get a little feedback. More than twenty of these sketches (and to be sure … the larger paintings too) will be viewable from September 14th (reception 5-7 p.m.) at the Staunton Augusta Art Center. I hope you can come … I would certainly love to see you there! Around 1500, some folks began to think that drawing, even unfinished sketches, were actually interesting in their own right. If a drawing was a sort of “first edition” of a visual idea … a pre-painted image … then it might be fascinating to see the image at it’s very earliest stage. Fresh off the press as it were … straight from the mind of the artist. 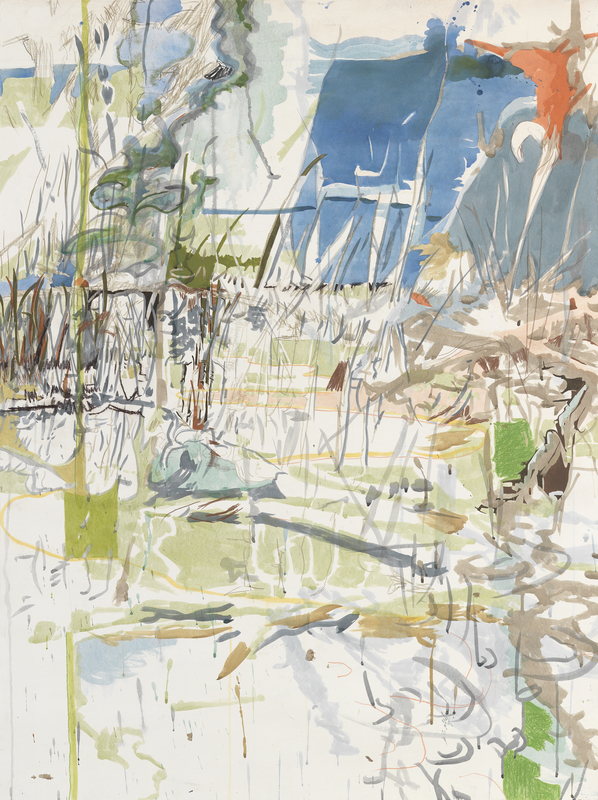 Tentative, quick, bold, or intimate visions … even incomplete images, began to be seen as having valuable qualities. Well, here you go … a few of my sketches; ones that I have been working on during the past few months. Some were completed with no intent of ever painting the subject. Most, however, were part of the preparatory process. For me, all are just as complete as the paintings they helped me create. Different, yes … but complete in their own way. I hope you enjoy getting a preview of them here. Let me know which ones you like, which ones intrigue you. Today I was concentrating on some very practical things in the studio. I previously mentioned needing to fix/repair some minor blips on a few pieces. Well today I pulled out the sandpaper and varnishes, the masking tape and the adhesives … even some ink and paint to work on them. I also decided to spend time getting some finished paintings on panels ready for exhibition … I need to varnish their frame edges! It is such mundane work really. Yet, sometimes, I find it to be SO very fulfilling getting things ready to go out/go back out the door again. For me it is sort of a ritual …putting things right again. Regaining a balance before getting down to the work at hand. And soon I will be getting some small pieces back from a show. I will probably need to clean and touch them up too. So, despite my tendency to let things hang at the edge of my to do list, I liked getting them done. Sure, I will have to do a few more in a couple of weeks, but now I am ready to throw myself back into the fray. Those new BIG mylar drawing and series of watermedia panel pieces are just waiting to be worked on. Delicious work indeed. … and working with students too. The fall college term has begun, and while I no longer teach full time, I really can’t ignore them. Besides, it is fun watching them make progress. 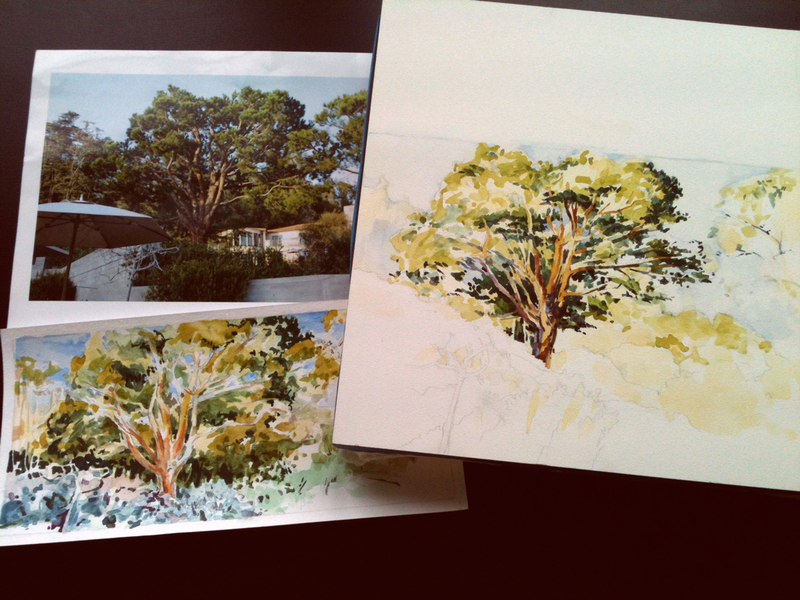 Drawing and painting, puttering about some at home/in the yard. Frankly there isn’t much more than that to report. Well yeah, the painting and drawing is really exciting and I shouldn’t downplay that good piece of news. And, OK, the weather is cooperating quite nicely for visual research/sketching outside and the house and studio will be getting some much needed electrical upgrades this week. (Is this the first hint of stage three in the studio renovation!? Only a little, sideways. The electrician has to be here anyway for some household work … so I am piggy-backing for an extra $100.00 or so) Hmm, I guess all of this doesn’t really warrant a ” there isn’t much” remark does it. Sometimes I am so silly, jaded, or spoiled … maybe all three. This work is one of my latest. It is a pretty simple, understated, playful, and hopefully, an elegant little piece. This one is only 12×12 and done with mixed aqueous media on panel. The title is “Late Summer’s Humid Sky. Currently it is in a show at Bridgewater College. Tomorrow I am hoping to get in some good photos or drawing done along a creek not far from the house, and maybe a trip to the museum in the afternoon too. If I get anything good from either of those, I’ll post again soon. During the last few weeks it has been much less hot … and frequently less humid too. With a little less water in the air, the clarity of the light has been intoxicating. A foretaste of Autumn is in the air! Other times, the humidity returns and cooler nighttime temps create morning fog which rises from the rivers and streams that abound in our hills and mountains. To be sure the greens still hold sway over the landscape, but subtle changes are becoming more and more visible. The vistas of Fall are not really here yet but the landscape is slowly opening up … summer’s ebb means that some trees and plants are becoming a bit less dense of late. This gives me new glimpses, new possibilities! 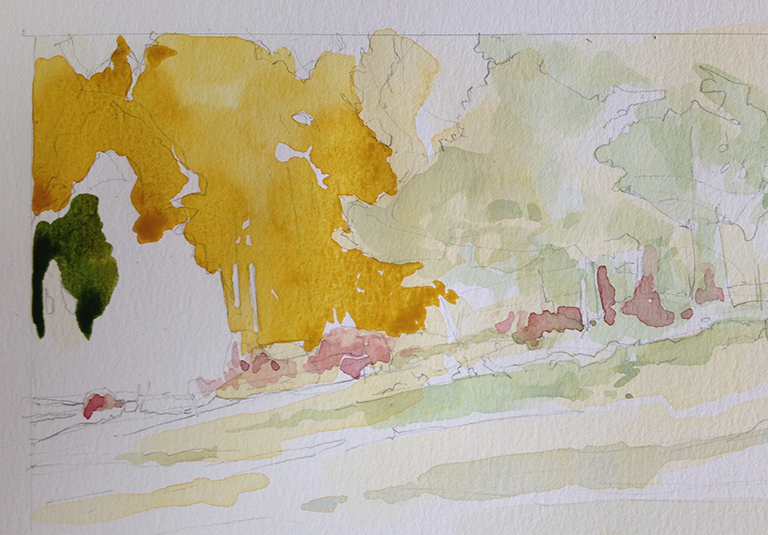 So I have been jumping at the chance to plan new works … and to get outside for sketching. The back of the car has frequently had all the “stuff” needed for sketching, drawing, and even photographing in preparation of new works. Even my briefcase is bristling with sketchbooks and supplies. Balance is hard when I am feeling so visually alive! My excitement may not be contagious but it has some marvelous consequences. It can mean that the whole painting gets done on site. Like this one I just did the other day. I admit that I might take the image to new places or re-use it in a much larger work. But it is SO enjoyable to work en-plein-air again!